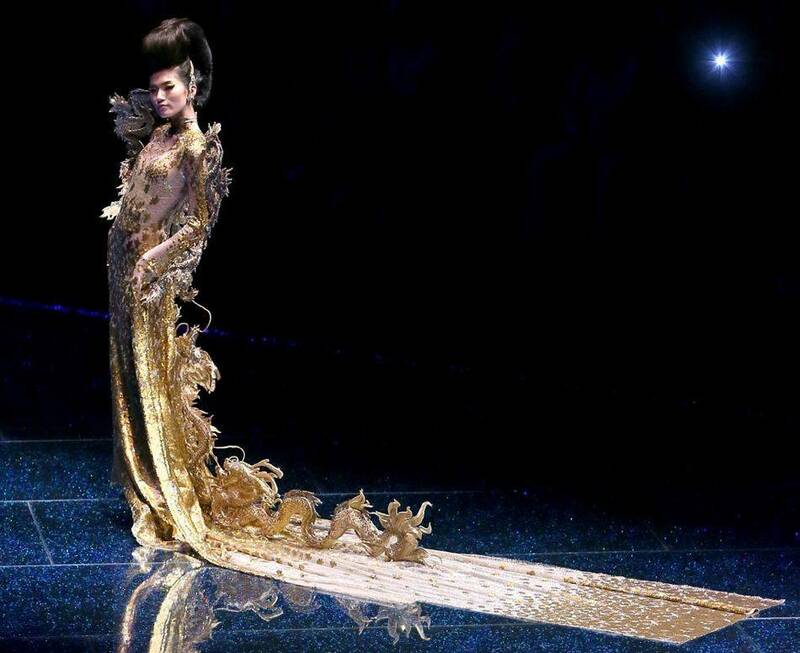 It I were to describe Guo Pei’s creations, couture or haute couture wouldn't begin to describe it. There probably aren't enough words in the dictionary to suitably describe her outrageous creations. Anyone who says fashion can't be art has clearly never laid eyes on anything from China's top designer whose pieces all look like they stepped out of the most over the top gallery and museum in history. Taking Chinese history and its rich culture as her inspiration, Guo Pei makes no compromise when it comes to creating and crafting exquisite gowns which sometimes take years to complete. It is feast to the eyes, inspiring as nothing I’ve ever seen before and way more avant-garde than anything Lady Gaga has managed to wear - Perhaps that is why the mother monster herself is so keen on getting her hands on one of her creations! The Chinese designer is coming to Singapore for Digital Fashion Week (DFW) and her show is going to be the highlight and closing show of the event is not to miss for sure. 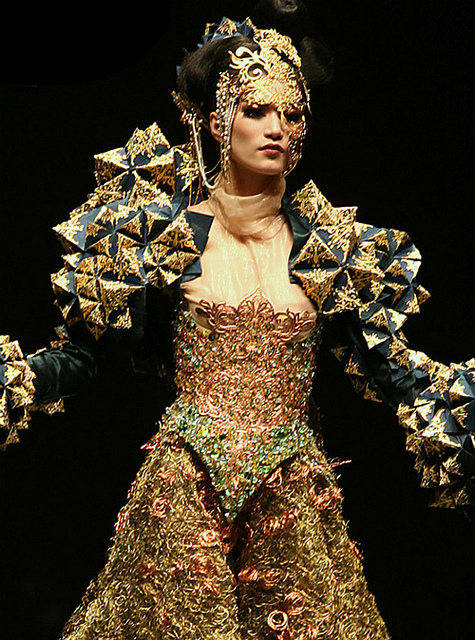 There aren't many times you get a chance to see something so spectacular and exquisite especially after the late Alexander McQueen passed away and John Galliano stopped designing. Guo Pei’s show is probably THE one thing I’m looking forward to most during DFW (especially when the equally stunning Andrej Pejic will be modeling the finale piece for the show!) and luckily for me I’ll get to see these gowns up-close backstage. Unfortunately though, my lack of Mandarin-speaking abilities means I won’t be the one interviewing Guo Pei for Google+ Hangout after the show so I’m very happy and honoured to have this Q&A with her and share it with you. Don’t forget to catch Guo Pei’s spectacular show Live-streamed on DFW website, youtube and enjoy daydreaming about these one-off unattainable creations as much as I do. Bonjour Singapore: You’ll be the closing the show for the upcoming DFW. What does that mean to you especially that the DFW is all about showcasing Asian designers? Guo Pei: I see myself as not only an Asian designer showcasing Asian culture to the world, but also as a Chinese designer who showcases our culture and trends to Asia and the rest of the world. What inspires you to create these exquisite gowns and costumes? What’s the inspiration behind your latest collection which you’ll be showing at DFW? I am inspired by my country's traditional wedding costume, our rich history and culture spanning some 5000 years and also the intricate differences in costume history. My strongest influence would stem from the unique cultural differences in my country. Your creations are extremely elaborate. How long does it take you to make one gown? Many of my creations are very time and labour intensive - the completion period ranges from a few months to a few years. In a world where our lives are becoming more and more about practicality. How does your extravagant work fit into that? In reality, although we pursue practicality and convenience in our daily life, we also crave the mental pursuit. In fact, this very pursuit of mental and emotional fulfilment is often manifested in art pieces. All art pieces need not only a creative inspiration, but also a certain amount of intensity for it to ultimately become a classical piece that can stand the test of test. I feel that as our pace of life hastens, we seek to slow down for a sense of stability. 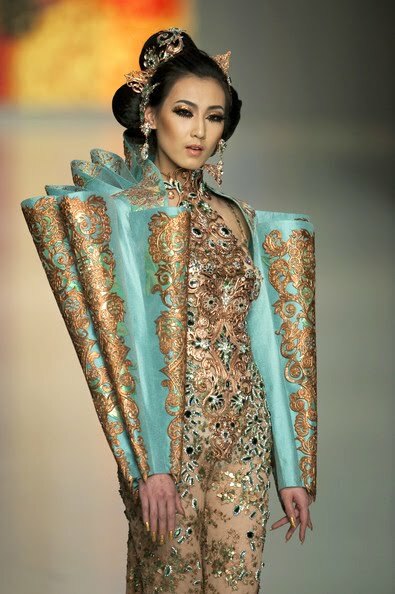 As the current theme expands on the idea of the Chinese wedding costume, the key elements will be the antithesis of speed and ease, and instead, emphasize on the importance of our heritage and its passage through time. We aspire towards posterity and I hope that my wedding dresses will be passed on from mothers to daughters, who will then pass it on to their daughters. China's strong economy has definitely created a market for couturiers, but I feel that the downturn in the West does not necessarily present an opportunity for us. Be it East or West, we would definitely hope for an optimistic shift of the world economy. In fact, the downtrend in the West does not bode well for us at all, because global advancement for us would require their recognition and support. There’s a thin line between theatrical costume design and wearable extravagant fashion. How do you balance that? I think there are inextricable differences in theatrical costume design and wearable extravagant fashion, which are yet subtly linked. Fashion is but an expression, sometimes an exaggerated expression on stage. In fact, if you understand the significance of clothing expression, you will be able to grasp the subtle relationship of these nuances. In life, our expression is convergent hence, there needs to be a moderation in all the details of the design in order to achieve that delicate balance. 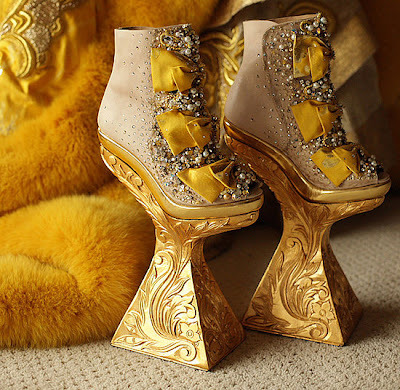 Some of my designs boast of an exaggerated flamboyance, some are reflections of practical life and I have even designed eveningwear for celebrities. This is a design philosophy that highlights the commercial practicality while toning down on the theatrics. To be able to master this, one needs to be able to master the delicate balance between the design details. In fact, the sphere for my designs is very broad - I have designed set costumes, gowns for show hosts and singers, red carpet eveningwear, everyday wear, wedding dresses (both Chinese and Western). I think design is a universal concept, and there is coherence between fashion design, architecture, interior design and furniture design. In fact, they do not have so many differences and that's why I am passionately interested in all these aspects. I love to design very much, and am willing to design for everyone. What do you think of the fashion scene in Asia? What’s the most fashionable city for you? Of course, international fashion also comprises of the Asian fashion culture and fashion in Asia should be combined with its Asian cultural characteristics. Tokyo, as one of the world's four major fashion capitals, has a very distinct character in its clothing. I also think Singapore is an excellent city for its urban planning, people's lifestyles and fashion sense. Are there any designers – past or present – whom you look up to or admire their work? I admire and worship a lot of designers from a very young age. Beginning in the early 1980s, when I began to study fashion design, I discovered Chanel and had a reverence for her. Later, I learned about Yves Saint Laurent and Christian Dior, I would forever place them on a pedestral. 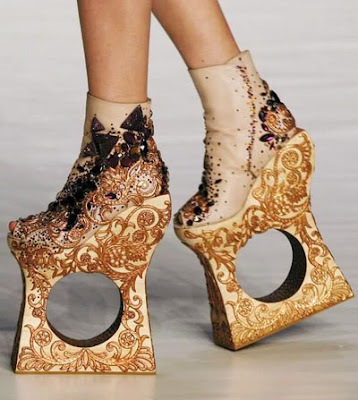 Of course, designers like Alexander McQueen, Japan's Yohji Yamamoto, Rei Kawakubo, and so many current young designers, I appreciate very much of their work. In fact, I think there are various reasons why each successful designer is successful in their own right - that's why I respect so many of them. You’ve dressed Chinese celebrities like Li Bing Bing and Zhang Ziyi, Any celebrity that you’d like to dress in particular? What about Lady Gaga? Indeed, my designs had been associated with a lot of celebrities - for example, Lady Gaga had always appreciated my design, and is still constantly in contact for new designs. But I do not think that designers should only cater to celebrities, and I hope to be able to reach more people across a broader spectrum. I am willing to design for everyone, and not only for the stars. Would you ever consider designing a prêt-a-porter line so more people can wear your designs? I am now considering if I should make it more accessible for people to be able to wear the clothing I design, and I hope that this desire can be realized as soon as possible. For the first 10 years, I did mainstream fashion. I felt that I failed to achieve my desire to "make more beautiful clothes" as there was no market for them back then. But as designers always pursue a potentially unrealistic desire, I was prompted to set up my Rose Studio atelier, and had been obsessed with the perfect design for the past 16 years. I also hope to expand on these high spending consumer groups, so that more people will be able to afford my designs. I believe it will be achievable in the near future. 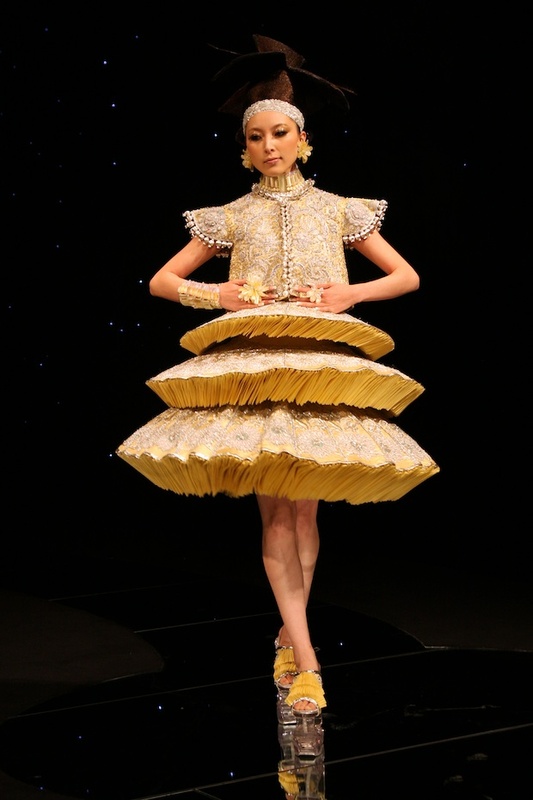 Guo Pei's closing DFW show will take place on Monday, October 22 at 7pm. You can catch it live on YouTube and don't forget to catch my co-host Yvette King's post show interview with the designer on the Guo Pei Google+ Hangout shortly afterwards.